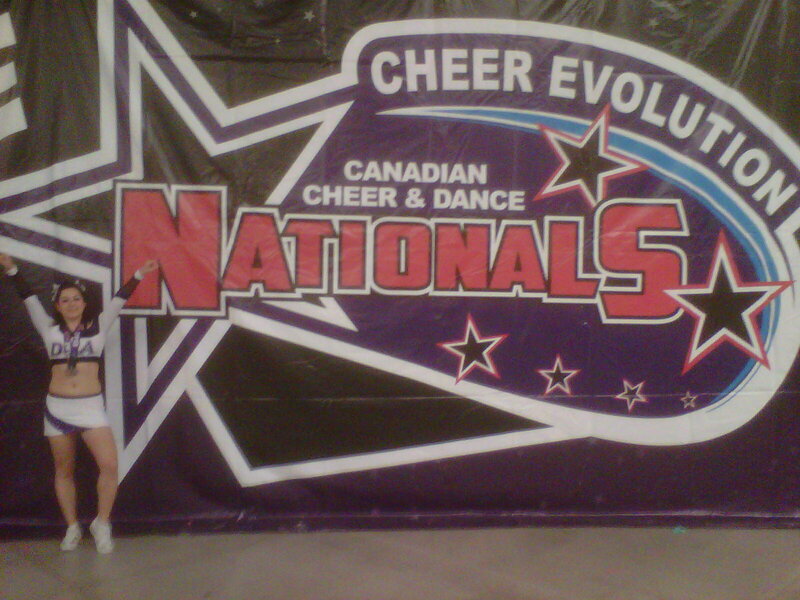 This weekend was Cheer Evolution Nationals in Niagara Falls! What an exciting weekend! This has always been one of my favourite competitions, because it’s so big and you get to see so much talent from teams far away and nearby! There is so much cheerleading spirit everywhere! As an athlete, it was my first and last competition of this season, so it was super exciting. FRIDAY: I competed in the Specialty Division with an individual Hybrid level 5 Stunt group. It was my first time competing in a specialty division so it was doubly exciting and nerve-wracking! On the warm-up mat, I ran into the girls from Cheetahs Cheerleading and their head coach Tracy, and they were so happy to see me and so supportive and encouraging! (I helped coach them at the beginning of this year with Tracy.) I was so nervous on Friday that I literally could not eat much all day! Practice warm-up went well though, and I was looking forward to showing off my skills on the mat. The performance went well, and it was really nice to hear lots of support from the other DCA athletes and from the Cheetahs girls. I think I rushed through the routine a little bit and wasn’t as sharp as I could have been, so I missed some of my counts holding my scale and pulling my scorp higher. But, everything hit and it felt easy to do. Watching the video after, I think there is quite a bit I can improve on, and next year I definitely want to add difficulty if I do a stunt group comp again (which I want to!!). Everyone was so supportive after I was done though and said I did really well! I wish I could do it again! It’s so sad performing at the last competition in general, because you’ve worked so hard for this one routine, and then after you perform it, you never have to do it again and it feels kind of like breaking-up lol. It felt so familiar and solid, and then all of a sudden there is a bit of a void, and then you have to get used to a new season with new stunts and a new routine! The other DCA girls also competed in a level 3 stunt group, and a few indys and a duo, and everyone pushed through and did great! At awards, my stunt group got 3rd out of 4 teams, which I thought was pretty good considering it was my first one ever! SATURDAY/SUNDAY: While this year I had not been practicing with Platinum, DCA’s Intl. Open Coed 5 team, a girl sadly got injured a week before, so I was asked to fill in for her as a flyer in her stunts. Getting to compete with Platinum was really exciting for me, and I felt confident as the stunts I had to do were easy, and the dance was really fun to perform! I wasn’t really nervous, and had no trouble on Satruday! I think everyone felt really good about that run and most stunts hit well. We were standing in second place that night, with 2 teams behind us and the PCT Cobras Worlds team ahead. The DCA Parent team, Golden Dragons also performed on Saturday, and really had a blast! The CheerForce Parent team that went before them deserves a shout-out as well – they wowed the crowd with some back-handspringing action by an athletic mom, and some solid stunts such as a 4-2-1 pyramid, co-ed toss-hands-cupie, and other solid stunts by parents. On Sunday Platinum did okay too, there was a bit of worry on the practice mats, but I think we pulled together nicely, and despite me not executing my basket perfectly (did just a pike on Sunday vs. a pike X-out on Saturday), we still ended up in 2nd place when all was said and done. The Cobras Worlds team that beat us was really amazing (on the practice mat; I didn’t get to watch them because they went right before us both days), and I’m sure their 1st place was well-deserved. The other DCA teams were great too – I got to watch and cheer on the Snow Dragons’ clean routine, and they got 2nd too! Great work to the Ruby dragons as well! On Sunday, I saw the Cheetahs’ Crimson Senior 2 team perform. For the first few months of this season I had the pleasure of helping coach these ladies (and Devin! ), and I have to say I was really impressed with what they put on that floor. They have really grown so much and really pulled through together, executing a clean, passionate routine that left them standing as National Champs in first place! I am so happy for these Cheetahs – they have such heart and passion! Congrats!! A few other shout-outs: The Cheer Sport Sharks’ White Cheek youth 5 sharks were really something to see! Very impressive skills and very solid stunting!! I also had the pleasure of seeing the Great White Sharks perform… WOW! This was perfection, and they were the well-deserved Grand Champions of Level 5. Such sharp stunts and such clean tumbling – not a stumble or a bobble! Very inspiring!! I was sad that I didn’t get a chance to watch the open teams of CCA Panthers, as these used to be my teammates, but unfortunately we had to go into warm-up just as they were getting on the floor. It was really great seeing them all however, and everyone was so supportive and nice. One interesting thing is that the Vancouver All-Stars weren’t present this year. Anyway, congrats to everyone who competed! See you all next season! This year I’ve kind of put this blog on hold as I tried to figure out my life post school, and I regret not documenting my cheer year here, because it was truly a memorable one. In the spirit of this past weekend’s Cheer Evolution Nationals 2013 competition however, I feel it mandatory to get back into blogging about my true passion. This year has been a bit rough for me, and honestly, the one thing that has gotten me through and has always been there for me was my cheer gym, DCA. As soon as I walk into that gym I feel my worries melt away and the only thing I need to focus on is training. It’s like a sort of meditation. Let me walk you through it. You walk down the stairs, walk through the welcoming open deep purple door, and are greeted by a sea of purple. As far as the eye can see, it’s purple sprung floor for miles (seemingly), beckoning you to come forth and leave your heart onto it. If you come at just the right time, when the sun is right over the gym and high up in the sky, large sun spots projected from the square skylights will be dancing on the violet strips of the floor – spotlights, ready for you to shine underneath them. It’s a beautiful sight. In the far end a rope hangs down mysteriously, ready to lift you high into the never-ending ceiling, so high it might as well be sky. Should you choose to take up its tempting offer, you’ll have to work hard to reach the top, but once you do, you will be rewarded with a sight like no other, a new dimension of the Purple Gym. If height is really not your thing, perhaps the 50 foot tumble track can lure you in with its shiny black surface and promise of a strong, controlled bounce. It’s easy to picture yourself tumbling along, handspring after handspring of bouncy bliss. It’s quiet in the gym. The other athletes haven’t yet arrived, filling it with the happy sounds of accomplishments and cheers. But soon they will. There is an industrial type of musky scent in the air, fresh and cool, yet strong. I like this smell. It’s familiar and comforting. It sticks to your practice clothes and shoes, and when you go home and you take them out of your bag, you can still smell purple pride on them, laced with that day’s accomplishments. I like my gym. At a time when you’re feeling lost and confused, it provides relief from life, from stress, from pressure, even if it is just temporary. The challenges of learning skills, and the feeling of accomplishing them gives me purpose and satisfaction. Travis, DCA’s owner and head coach really motivates you and celebrates and recognizes every small accomplishment, taking the time to connect with every athlete, to make them feel included, special, and important members of the gym. He is a walking sport and body encyclopedia, and is dedicated to coaching through proper and repeated drills and progressions, through hard conditioning and smart working rather than a ‘just do it’ or ‘just throw it’ stunt and tumble philosophy that is still widespread practice in many gyms. When I started writing this post, I didn’t mean to turn it into a review of my gym, so I apologize if this feels too ‘scripted’. I simply want to share my love for this place, because it welcomed me so wholeheartedly and helped me out a lot this year. Those purple mats really have a way of etching themselves straight into your heart. In light of the recent PCA Nationals 2012 competition (this past weekend), I’ve been inspired to write this post on the situation of Canadian University/College cheerleading. Let me get straight to the point – why are Canadian College/Uni teams so weak?? Our post-secondary cheerleaders really pale in comparison to even little known American university teams. Yes, we have a few well-known teams. Everyone knows Western and Queen’s. Everyone admires them. But why on earth, from a whole big country do we only have two really famous/amazing large coed university teams?? Moreover, watching some of the other teams really put me to sleep. Their routines were slow, and I found myself cringing every time they put a stunt up. Technique did not seem to be present, and teams were happy to simply participate. It was evident some teams had true newbies. Don’t get me wrong – I’m not a competition-obsessed newbie hater. In fact, I’m just the opposite. I don’t think you should put out a team on the floor that is not ready to compete. PCA Nationals is the biggest university cheerleading event each year. There is serious competition. If you don’t feel confident that your team will max out the score card cleanly and put out an entertaining, safe routine, don’t let them embarrass themselves! I speak as an athlete having gone through this experience, and from a coaching point of view I would not want to put my athletes through that. I’m not sure what the problem is, but I have a few guesses. Just like many high school teams, Canadian university teams just don’t have coaches who are experienced enough in technique. And just like in many Canadian all-star teams, technique is not largely a focus when you’re a month away from comp and still can’t hit your routine. New cheerleaders get thrown into routines, without having learned or mastered the very basics of body awareness and control. It is not pleasant to watch this. When a collegiate level 6 team has double base front tucks but no double full dismounts, you know a level progression has been skipped. Going for higher difficulty skills that may be ‘easier’ to attain is not safe but is unfortunately a common practice that I had the misfortune of experiencing as well. Another part that contributes to this is that in order to remain competitive with the other teams, as a university or college, it is mandatory to compete at a level 5 or 6. As a result, students who’ve never tumbled or cheered before must basically do a ‘crash course’ in cheer – and you either sink or swim. Other university sports don’t take newbies or athletes who are not experienced and skilled. They advise them to try for intra-murals. So, why do so many Canadian college and university cheer teams accept everyone? Clearly, low numbers of participants due to the sport not being as widespread as in America is one of the causes. But I don’t think that should be the reason to accept everyone. A better solution would be to create an ‘intra-mural’/recreational team that can take their time learning technique from the beginning in all aspects of cheerleading, while keeping your experienced athletes competitive from the start. One last thing – jumps. In Canada, you can tell the difference between an All-star and a College team just by looking at their jumps. Because good, flexible jumps are a skill that takes constant practice and months of development to perfect (dare I say years for hyper-extended jumps, especially in older athletes), college and university teams always seem to be sagging in this, chests low, legs low, jumps low. Just something I’ve noticed. Now some interesting updates in Canadian university cheer – after not having a team for quite some years, Guelph University truly makes a comeback at PCA Nationals with not one but TWO open teams, with the All-Girl level 6 team sweeping first place. Impressive. Western makes a great choice by taking all the motivated extra athletes that want to be on their team, and creates a second, All-Girl, “Western X” team. Great idea, and the girls were looking great on the floor too. Western beating out Queen’s for (I think?) the second year in a row! And of course, Humber Hawks, (my former team!) sweeping in first with a clean routine, great work! First of all, I’d like to apologize for going MIA this summer. I had to take a summer semester in school and write my graduating thesis while working full-time, so cheer wasn’t the main thing on my mind. Now however, it is. And I have a little rant about something that’s been bothering me lately. You may recall from my post about tumbling at 20 that I’ve been taking private tumble classes at a gymnastics gym. Well, when I first started, I came in demanding deadlines for every skill I wanted – handsprings by May, tucks by July, etc. The deadlines came and went, and with them came a realization – I didn’t have the skills yet, and I was okay with that. You see, my tumbling coach didn’t really care about timelines or dates – rather, she cared that I learn the skill PROPERLY, and technically correct to a tea. Most cheerleading gyms in Canada don’t take this approach to teaching tumbling or stunting. The sport is predominantly about competition – learning routines, moving up levels, and consequently, learning skills as fast as possible, leading to shortcuts in learning and forcing the body to perform things it isn’t ready for – ultimately resulting in injury. When a gymnast learns back handsprings, she spends hours and hours doing drills to perfect the technique before throwing the handspring itself. Handsprings aren’t even taught until level 4! Some cheer gyms, by contrast will spot kids to just throwing handsprings, without teaching prior body control through hand stands and walkovers, simply because they want the team to compete at Level 2. (What’s the point of teaching you Level 1 skills if you’ll be on a Level 2 team, right?) In addition, once a gymnast learns a back handspring, she doesn’t immediately start working on tucks and layouts and fulls. Skills are learned very gradually, ensuring that the athlete attains 100% body control over every skill. In cheer, gyms expect athletes to quickly advance through tumbling skills, whether they are ready or not. As soon as a kid gets their handspring, coaches are already urging them for tucks. This applies to stunting as well. My high school (and many high school cheer teams for the matter) was a perfect example. Our coach was a dance teacher and had never done cheerleading before, and we would just throw stunts seen from YouTube videos on the hardwood floor in the gymnasium. As a result, here I am 5 years later, still trying to break some of the bad habits I learned early on in stunting. Stunting, just like tumbling, needs complete body control to be attained progressively and evenly. We want our athletes to be able to perform new stunts with ease because they know how to control their bodies, rather than have to rep out a new stunt 500 times before somewhat sticking it. Often, new flyers will be thrown into high levels (3, 4, 5) to fit the team numbers and routine formations, because they have the tumbling requirement for that level. Then coaches get frustrated with these flyers when they have trouble in the air, and the flyers don’t feel confident that they can do it. I recently went to see a Cirque du Soleil performance. Their acrobats have such complete body control that coming down from stunts doesn’t seem possible. When I watch cheerleading teams like California All Stars level 5, I also see this. Yet when I watch any of the local cheer competitions here in Ontario, there are too many teams that are dropping stunts, or ‘just barely’ keeping them up there. What ends up happening is a competition between which team is ‘less worse’. If we want to create competitive athletes, we need to focus on coaching them slowly, consistently, deliberately, and with purpose for every drill. We need to take a gymnastic-like approach and stop focusing on competing. Competition should happen when the athletes are ready for it. True, it is way harder to coach a TEAM of 25-30 athletes this way versus individuals, but it’s the only way that we’ll minimize injury and create well-rounded and confident athletes. Every other sport offers an array of recreational classes before athletes are even allowed to compete. Not cheerleading! Recreational classes are usually an after-thought at gyms, and are mostly offered to kids under 12. Everyone else must be competitive! Tiny and Mini teams compete! But the pressure to compete doesn’t allow us to coach that full range of skills, and contributes to the taking of shortcuts in skill development. Synchro swimmers don’t learn routines before learning individual skills. Neither do gymnasts, or figure skaters, or ballerinas. So why do cheerleaders? There is hope though, and I think coaches are starting to realize this. In particular, a new gym that opened this year in Markham, Ontario – Dynasty Cheer Academy – has made positive leaps in changing the way cheerleading is taught. By teaching every athlete from the basics using gymnastics/acrobatic-like drills and progressions, owner Travis Stirrat is striving to produce athletes who know what they’re doing and why they’re doing it, and who truly understand their bodies in this complex sport. Judges reserve the right to assess warnings and/or deductions when a team’s choreography, uniform, make up, bows etc. do not meet the standards of ‘appropriate’ as described in this policy. All facets of a performance/routine, including both choreography and music selection, should be appropriate and suitable for family viewing and listening. Music or movement in which the appropriateness is questionable or with which uncertainty exists should be assumed by the coach to be inappropriate and removed as to not put their team in an unfortunate situation. No risqué, sexually provocative or lingerie looking or inspired uniform or garments allowed. All uniform pieces should adequately cover an athlete and must be secured to eliminate any possible wardrobe malfunction. Appropriate undergarments must be worn. In addition to the below specific guidelines, athletes must also consider that a combination of uniform pieces may also deem a uniform appropriate or inappropriate. When a skirt is worn as part of the uniform, briefs under the skirt are required. The skirt must fully cover the hips. The skirt must completely cover the briefs and must fall at least 1 inch below briefs (regular and boy cut briefs). When shorts are worn as part of the uniform, there must be a minimum of a 2” inseam. Uniform tops may not include an exposed midriff except for Seniors which may have a maximum of 10” between the skirt/short top and the uniform top bottom. Uniform tops must be secured by straps or material over at least one shoulder or around the neck (tube tops are not allowed). MAKEUP AND OTHER – goes into effect with the 2012-2013 season, but will not be enforceable by deduction until the 2013-2014 season. Makeup – Makeup should be uniform and appropriate for both the performance and the age of the athletes. Face/Eyelid Rhinestones are not allowed. False eyelashes are allowed but may not be decorated in rhinestones or additional jewelry. Bows – Bows should not be excessive in size (acceptable bows are generally no more than 3” in width) and shouldn’t be a distraction to the performance. Bows should be worn in a manner to minimize risk for the participants, should be adequately secured and should not fall over the forehead into the participants’ eyes or block the view of the participant while performing. Okay, let’s face it – cheer is addictive. But why? What makes it so difficult to quit, or to even think about quitting, and how do so many people get sucked into this sport, only to emerge some 15 years later, (mind you, only because their broken-down and over-stretched bodies could no longer take it) with the final realizations that retirement time has probably come. Why do we continue suffering through countless hours of treachery, sweat, and fear of heights, when we could just be sitting at home relaxing, or doing a lower-intensity sport like aqua fitness? Surely, those must be better for our bodies? I’m sure you’ve all got your clever answers ready – “I love the athleticism!” or “It keeps me in great shape”, or even “It gives me confidence and challenges me to attain new skills!”, you might say. “Perfecting a new stunt or a tumbling pass feels amazing!”, or “I love the teamwork and my teammates.” are also viable options. I hear you, and I feel you on those points too. For most all-star cheerleaders, tumbling is a skill that is picked up either before cheer altogether, or is learned along with cheer at a very young age. I was introduced to power cheer at an age where most elite cheerleaders are already competing at world’s – and here I was, seventeen and learning double-base cradles. Tumbling wasn’t much of a question – on my high school team our most advance tumbling pass was a running cart-wheel. Our routines didn’t even have a tumbling section. Then I somehow made it on my college team, where I realized I’d have to learn to tumble pretty quickly if I wanted to continue cheering. I remember watching a level 1 team at my first competition and admiring their back walkovers, which seemed like a difficult feat to me. Handsprings felt like something I could only dream of, and people who could handspring were my idols. So after a gruelling three-month summer of once a week tumbling, I managed to achieve a bridge-walkover. Though I had once marvelled at this skill, I wasn’t satisfied in the least. I was by far one of the oldest girls in the class, and I watched with envy as 14 year-olds tucked, flipped, and twisted effortlessly. My semi-walkover seemed pathetic in comparison. I had level 1 tumbling (barely) on a level 5 team. I knew that if I could just spend more time and practice a lot, I could achieve a handspring. And OH, how I wanted that handspring! I was never quite satisfied with skills I achieved, even in stunting. I wanted to get my scorp in the air so bad, and while I was happy the day I got it, by next practice I was already looking ahead to what skills I still hadn’t achieved. The same ethic applied to my tumbling. A back walkover meant nothing since the day I got it. The following year I transitioned to all-star cheer. They didn’t have a tumbling requirement, but I knew that if I wanted to go far I’d have to tumble. I had an advantage, being a flyer, but I still didn’t feel like a well-rounded cheerleader. After all, what kind of cheerleader couldn’t tumble? At the time, I couldn’t take any more tumble classes, because the gym was too far away from my school, and I couldn’t afford the costs either. Finally, in my last year of university, and at 21 years old, I put my mind into achieving some basic tumbling, and I started taking private lessons at a gymnastics gym close to my school. After 3 lessons, I was doing unassisted back handsprings on the trampoline, and learning back tucks off the mini tramp. I’ve been taking lessons for a month and a half, and am starting to work on round-off back handsprings on the tumble track. I thoroughly enjoy the classes, and feel no pressure because I’m only competing with myself, and every small feat feels big to me. I hope to take my handsprings to the floor soon, and believe I can do it. But I can’t help but wonder if my body will give out at some point, and limit my progress. After all, most tumblers start out much younger than me. The non-tumblers on my team all claim that they’re too old to learn to tumble, but is that just a restriction of the mind, or is it really possible to learn to tumble at twenty? Is there an age that’s too old for this sport? Or can willpower trump age? Does this age apply to stunting too? I’m not sure, but I’m not about to let the answer stop me from trying.